Lenovo’s K-series is a direct competition to Xiaomi’s budget smartphones. It can compete with Xiaomi in terms of both Specs and Pricing. Lenovo K6 Note is a good smartphone with Qualcomm SnapDragon 430 chipset, 3 GB RAM and 32 GB internal storage. It has a Full HD Display and a large 4000 mAh Battery. Rooting of the Smartphone allows the users to tweak and modify the device. Unlocking and Rooting will void the device warranty. We will not be responsible for any mishap that happens to your device during unlocking and rooting process and hence, you should proceed at your own risk. Take a full backup of your smartphone because everything will be wiped out during the process. Enable Developer Options, USB Debugging and OEM Unlock On your phone. Install ADB and Fastboot on your computer and connect K6 Note to your computer via USB. Download the K53a48_Android-M_unlock_7M.zip and extract it. Make sure USB debugging and OEM unlock is enabled on your device. Run the Unlock_Bootloader.bat file from the extracted folder, with administrator permissions. This scripted command file will unlock the bootloader of your device. First boot after the process of Unlocking will take some time. Do not interrupt the process. To disable the Secure Boot we need to flash modified boot image. In the ADB directory, Right click on the white space while simultaneously holding the shift key. Then select the open command window here option. Enter the following command to reboot your device into bootloader. To flash the modified boot image. Download and Extract TWRP And Do not Turn off your device. Now, Run the Flash-TWRP.bat file with admin rights from the extracted folder. This Scripted file will install the TWRP custom recovery and then Reboot your device. Download the Latest Su.zip from the Official Chain-fire website. Place it in the internal storage of the device. Reboot your device into TWRP and Tap on the install Option. Navigate to the SuperSu.Zip file and select the file. Confirm the flashing of the zip file by swiping right. Go back to the main menu, Wipe Cache/Dalvik and then reboot your device. That’s it. 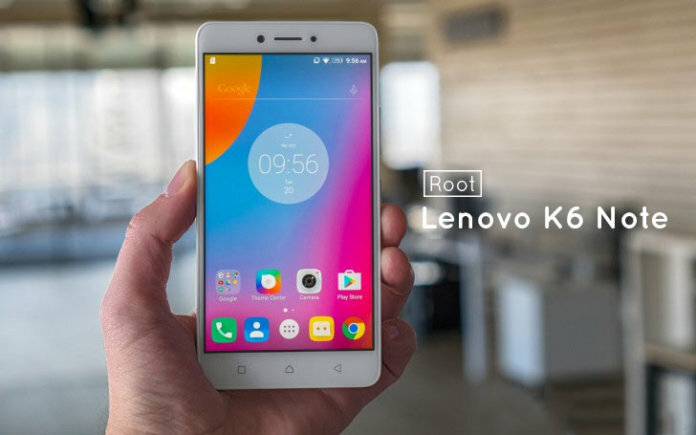 Reboot your device and you just successfully rooted your Lenovo K6 Note. For any queries, please comment below, Have Fun!